While a lot of the country is still digging out from winter, spring has officially sprung in Las Vegas. Many of the city’s cocktail menus are getting a floral makeover for the season, and drinks with things like floral-infused syrups, floral liquors, and petal garnishes are on the menu at a number of hot spots up and down the Strip. “If Riesling and kombucha play the part of Mary-Kate and Ashley Olsen in the “It Takes Two” cocktail, then lavender bitters is Steve Guttenberg. Without it, the drink wouldn’t be complete,” Hunter Welch, assistant director of beverage at the Bellagio Resort & Casino tells Paste. He was the brains behind the ‘It Takes Two’ cocktail currently on the menu at Roy Ellamar’s Harvest restaurant in the resort. Directions: Combine all ingredients (except kombucha) into mixing tin with ice. Shake vigorously. Strain into collins glass over fresh ice, top with kombucha. Add garnish of raspberries and mint. 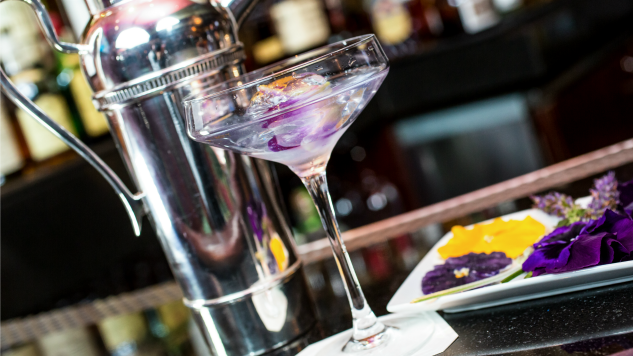 Spanish Gin and Tonic – Julian Serrano Tapas at ARIA crafts a compelling Spanish Gin and Tonic program comprised of four G&T varieties, each adorned with matching flowers to accentuate the beverage’s flavor profile. The Diplomat stirs Bulldog gin, Cassia, Marcona Almond and Q tonic water together with a lemon peel and lavender to create a robust flavor for the taste buds that evolves with each sip. Madam Shin – An evolution of flavors, China Tang at MGM Grand offers a subtly sweet selection- inspired by China’s culture and lifestyle during the pre-opium war era – with a flavor profile that changes as a dollop of house-made Asian pear sorbet gradually mixes into the glass of Veuve Clicquot Yellow Label, Kai lychee vodka, Domaine De Canton ginger liqueur, and Italicus Rosolio Di Bergamotto liqueur. Floating atop is a single edible violet flower, adding a pop of color and an element of beauty. Lago Cocktail – A delicate rose is frozen in a sphere of ice adding a visually stunning element to the Lago Cocktail at Lago by Julian Serrano at Bellagio. The work of art is submerged in a smooth blend of Belvedere vodka, Amaro Montenegro, agave, lime and strawberries to create a delightful flavor for the taste buds. Sidestep Cocktail – Skyfall Lounge at Delano Las Vegas shakes things up with a chamomile tea-infused tequila that’s paired with Yellow Chartreuse and lemon for an extra kick. Honey is added to draw out the earthiness of the tequila and natural tannic aftertaste of the chamomile tea – creating a smooth, aromatic drink perfect for the spring season. Calm & Connected – This chamomile tea-infused syrup and Empress 1908 gin cocktail is equal parts sweet and tart. Aureole at Mandalay Bay adds layers of tang to complement the syrup’s smoky flavor with Cantron grapefruit liqueur, Bitter Truth grapefruit bitters and grapefruit oil zest before garnishing it with a colorful pansy flower.